A Riverview couple decided to grieve the loss of their infant son by honoring his legacy with a worldwide call for kindness. RIVERVIEW, Fla. — Lindsay and Michael Hernandez suffered a staggering tragedy in 2016 when their son Christian passed away shortly after being born. “We made a vow that day that we were going to turn to each other instead of turning away like some couples do,” says Lindsay. 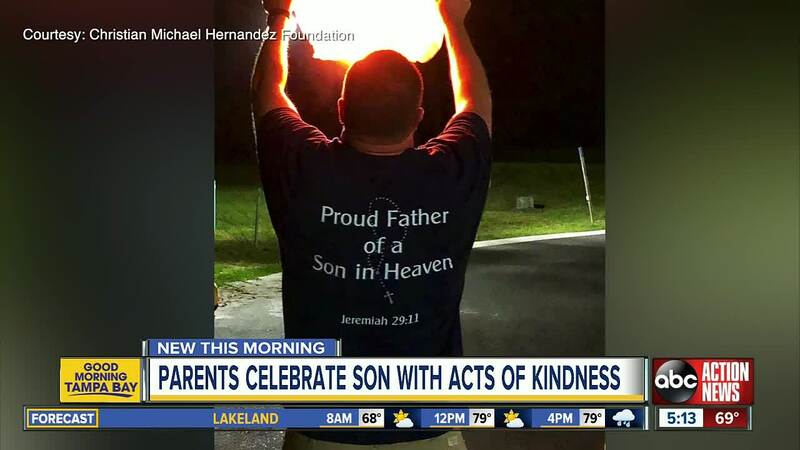 They wanted to grieve by honoring their son in a positive light. “We decided we were going to do something. We didn’t know what," adds Lindsay. "But he was not going to be forgotten." Both parents are educators. Lindsay teaches special education in Hillsborough County. Michael is the principal at Northeast High School in St. Petersburg. “We’re in education so we dedicate our lives to the field of helping others,” says Lindsay. They decided to create the Christian Michael Hernandez Foundation . Its mission is to urge people all over the world to “be the light” and perform acts of kindness in honor of Christian. “We’re not the only people dealing with trauma and tragedy,” says Lindsay. Thanks to word of mouth and social media , Christian’s light has spread from the Tampa Bay area to Tanzania where people are orchestrating hunger and food drives — and with people remembering Christian with acts of love and giving. The foundation will surprise people in the Tampa Bay area with awards for “being the light" on February 25, which is Christian’s birthday. Michael is proud of his son and his loving legacy. “He makes us feel like we’re doing a good job as parents,” Michael says.